As recollections fade, I’m careful not to claim the recent as the biggest or the best of anything, but this past week’s germination of grass is as thick as any I can recall. How well it will endure the above-average temperatures predicted to push 80 degrees for the next ten days remains to be seen—no rain in sight. Yesterday, Robbin and I made the Kubota trip to the Paregien Ranch with salt, mineral and the last protein lick until next summer while checking the cows, calves, and the rain gauge: 1.44”. More like spring than fall, our new green grass, even at a higher elevation of 2,200 feet, has begun to usurp our ample old feed. Cow numbers light due to the heavy culling during the drought, we haven’t had to supplement these cows with alfalfa yet this year—a good thing. It will take two or three ‘normal’ seasons before we get our cow numbers close to a sustainable capacity again, unwilling to buy non-native cows that take at least two years to finally acclimate to this ranch and cycle regularly. Checking cattle once a week, the Kubota has become so familiar on the Paregien Ranch that wildlife are seldom startled. With tall feed and cover, we haven’t seen many deer in the past six months. It was reassuring to see that the Blacktail buck above had survived hunting season, now in rut and somewhat oblivious to our presence. With a doe and fawn grazing acorns, he was more content to rest in the shade than leave. Early mornings cool and talking firewood earlier in the week, we came off the hill with a load of dry Manzanita. 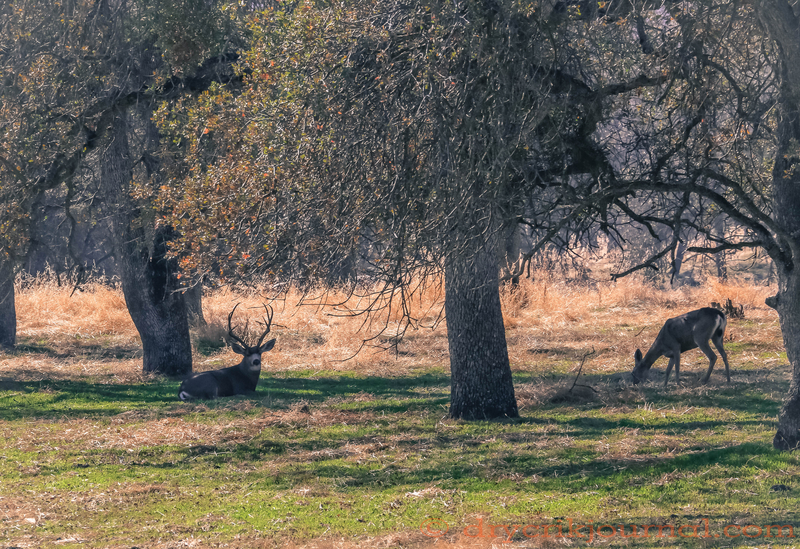 This entry was posted in Photographs, Ranch Journal and tagged cattle, Paregien Ranch, photography, weather, wildlife. Bookmark the permalink. Real nice buck, fat and blue, 4 x 3.